If you're a college student considering a career in print journalism, reconsider. Student loans, few openings, and a harsh work environment may keep you from pursuing your dream as a print journalist. 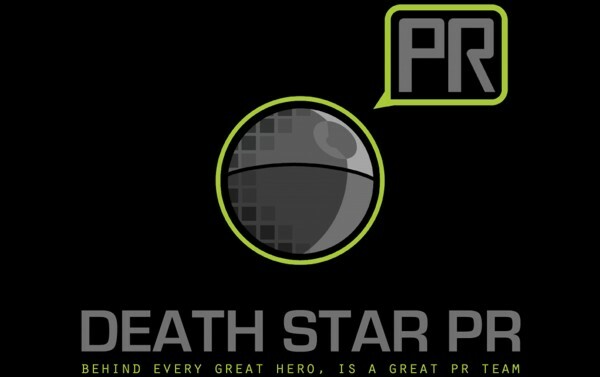 But changing career paths doesn't mean you'll have to do PR for the Evil Empire. "Go Back in Time and Be Born to Rich Parents Who Will Humor Your Quaint Little 'Career'"; and "Seriously, Though, Have You Considered Automotive Repair?" I love that woman's snark. We didn't get into time travel, automotive repair, or the benefits of a trust fund as it relates to pursing journalism, but I we covered a lot of ground about how to turn a journalism degree into something other than journalism. On the panel, I was joined by Emily Cleary, junior brand associate at Monika Dixon Public Relations; Danielle Reading, assistant strategist at the boutique media and communications agency PHD; and Jenn Kloc, marketing coordinator at Jellyvision (a former fellow master's student and all around awesome person who shot my engagement photos). 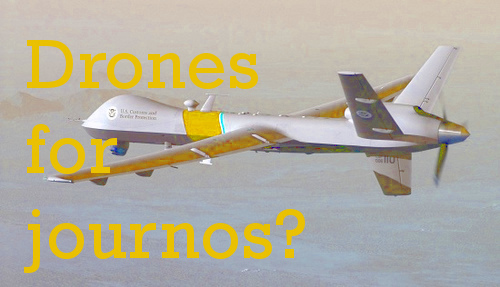 Recently I was asked by a Brazilian Journalist, Nina Gazire of the art and design magazine seLeCT, about where drone journalism came from, where it exists now, and where it might be going in the future. Below are the answers I sent. A lot of progress with developing the drones has been made since this email, but everything else is still very relevant to the subject of drone journalism. 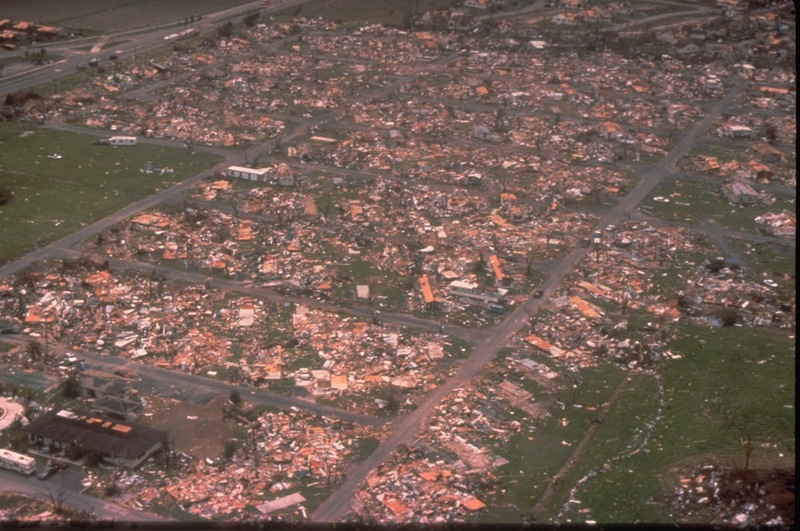 Aerial photograph of the devastation from hurricane Andrew in 1992. Steve Doig, who was a reporter for the Miami Herald at the time, used his data journalism chops to survey the damage and write a Pulitzer-prize winning expose on construction malpractice. Earlier this year, I asked him what aspiring data journalists should be learning. I cringe when bloggers begin a post by apologizing to readers for a lack of updates. This is partly because most people do, or should, understand that the gig doesn’t pay. But mostly, every word you waste on explaining your absence is one more chance for a reader to lose interest and go somewhere else. So I’ll just say it’s been an eventful couple of months, and tell you why it’s actually relevant to this blog. Having just finished a master’s in journalism at the University of Illinois, I was extremely lucky to find a National Science Foundation grant that is training better K-12 science teachers. At the grant, we do this by teaching lessons in entrepreneurial leadership to science teachers. That translates into experiences like students constructing their own spectrophotometers, or high school students manufacturing their own biofuel, or even collaborations where high school students set up demonstrations on electricity for grade school students to work through. It’s a radical, but practical approach that hopes to improve the nation’s competitiveness in science teaching. In January, results from the National Assessment of Educational Progress report card on teaching showed that 47 percent of all high school seniors in the country are deficient in the sciences. Why would an NSF grant want a journalist? For one, I understood their language. Being a former undergraduate student of mechanical engineering, I had taken chemistry, physics, calculus, and statistics courses. Secondly, they wanted someone experienced in the ways of conducting interviews (i.e., collecting data) and translating the information into an easily digestible form (i.e., not only help write reports for the NSF but also write for public dissemination). That was all they were looking for initially, until I mentioned I had worked with NodeXL, a template that turns Microsoft Excel into a tool for analyzing social networks. I was introduced to the program by Brant Houston, in his investigative reporting class at the university. The Excel plug-in comes in handy during an investigation when you need to do things like plot like the flow of money or political influence within organizations or among groups of people. As it turns out, the grant was conducting a first-of-its kind analysis of teaching networks and needed someone with my expertise. The moral of this story could be that if you develop skills beyond traditional journalism in undergraduate/graduate school, it’s easier to parlay your skills into a new career when the journalism jobs market tanks. But the fact is I’m still practicing journalism, albeit during my off-hours. I recently submitted an investigation of a local church with more than $100,000 in tax liens to CU-CitizenAccess.org, a Knight foundation-funded community news website. The investigation required digging up and looking through nonprofit tax records, federal tax liens, city ordinances, and even credit union call reports. The investigation stemmed from a legal notice I stumbled upon in the aforementioned investigative journalism class. Rather, this is why a journalist should learn data journalism: to become a more versatile investigator. When I was teaching introductory journalism classes to freshmen and sophomore university students, I wanted them to know exactly why it’s useful to have computer and data journalism skills. So I put together a presentation on data journalism for a lecture of about 100 students, and asked data journalism veteran Steve Doig, who is currently the Knight Chair at the Walter Cronkite school of journalism, for a few bits of advice. Google announced Monday that it would give $20,000 to journalism students who can mash-up computer science and enterprise reporting. The scholarship program is a joint venture between the Associated Press (AP) and Google, and will be administered by the Online News Association (ONA). The AP-Google scholarship is one of the latest initiatives to bolster the ranks of journalists with data specialists who can use computer skills to sort, filter and describe important trends hiding in a sea of public data. Those trends can be a springboard to launch investigations into a wide variety of issues, including poverty, health, crime and social justice. The need for those types of computer and analytical skills is only increasing as governments begin to publish on the internet troves of documents that were previously difficult to access. Brant Houston, the John S. and James L. Knight Foundation chair for enterprise and investigative reporting at the University of Illinois, wrote in the summer 2010 Nieman Reports that data journalists could help improve the nation’s investigative reporting strength. “Digital media’s capabilities might provide ways to hold public agencies accountable while expanding journalists’ role as community watchdogs,” he wrote. Drones are mostly associated with the ongoing war in Afghanistan and Pakistan – where they continue to shoot missiles and drop bombs on the insurgency. Between 1,492 and 2,378 died from drone attacks in Pakistan between 2004 and May 24, 2011, according to theNew America Foundation, and the number of drone attacks have more than doubled under the Obama administration. The drones present serious concerns for the Pakistanis about their own safety and sovereignty, and have sparked protests at the UK parliament. The military-industrial complex and global politics have greatly advanced both the application and development of military drones, or Unmanned Aerial Vehicles (UAVs), as they’re called in military parlance. A large, jet-powered stealth drone played a majorrole in tracking down Osama bin Laden. Now there’s entire military expos dedicated solely to UAVs. But armed conflict and espionage are not a drone’s raison d'être. Strictly speaking, a drone is simply an unmanned vehicle that guided remotely, or is self-guiding. And just as the advancement of drone technology has increased the military’s capabilities, those advancements have trickled down to the private commercial sector. With a little know-how, a resourceful civilian – or journalist -- can order “off-the-shelf” components and make and fly a drone. While the country continues to shift its gaze from a paper-based to a pixel-based outlet for information, something far more profound than a digitized transcription is taking place. Two-century old pillars of the fourth estate are falling, and experts are divided as to whether journalism is headed for a dark age or a renaissance. In the midst of this transition, journalists are abandoning the vocation and running for the hills. These people are taking on a plethora of career paths, or in some cases, reinventing themselves as bloggers and citizen-journalists. Coming into the pillaged ranks of journalism are the Millenials, a techie generation overflowing with energy, ideas and hope, but who are dry on the economic and editorial support they need to take the reins of the future media. All of this is taking place in a time of great economic disruption, widening political divisions and wars on two fronts. The need for accurate, critical journalism only increases in such interesting times. Yet, there is doubt whether our mass communication satisfies that need, and if the new, converged system we are adopting can provide the quantity and, more importantly, the quality of information required to sustain a democracy. This blog aims to make sense out of this evolution in journalism, technology, society and democracy. But analysis and commentary are only useful when one knows the stakes. It’s trivial to extol on that which is trivial. Journalism, as Upton Sinclair would tell you, is deadly serious. Chapter 113 of Sinclair’s book “The Brass Check” is titled “The Mental Munitions Factory,” a name which I borrowed for this blog to establish its vision. The book is regarded as one of the first, and still one of the greatest, critiques of the business of American journalism. Robert W. McChesney, a renowned expert in the political economy of media, and Ben Scott, Freepress.com Policy Director, wrote in an introduction of a recent reprinting of the book that “each of the 100 first pages contained the potential for a libel suit.” Sinclair admitted it was “the most important and most dangerous book” he ever wrote. I can’t - we can’t - do this alone. That’s what traditional media journalists are finding out, and what new media journalists have known from the start. So I’m encouraging that if you read this and love it, hate it, understand it or don’t, contribute by making a comment. You don’t have to be a scholar in the political economy of media to make a worthy contribution. There is no truly democratic process unless all are accessible, and all are accessed.